I really enjoyed Sanctuary Bay. It was a different take on boarding school stories, and one that I enjoyed very much. While it wasn't perfect, I can honestly say I am happy that I gave it a chance. And I would absolutely recommend it! Sarah has been an orphan since she was a tiny girl, moving from foster home to foster home, never fitting in. When she receives an invitation to become a student at the illustrious Sanctuary Bay Academy, she thinks it is a joke, that somehow she received it in error. Even when she arrives on the island, she still can't quite believe it. Once she arrives and starts making friends, she is so excited about the possibilities, she doesn't even think about the strangeness of the island. That is, until she joins a secret society, and witnesses the group committing a murder. Now, Sarah is determined to find out the truth, with the help of an unlikely ally, even if it kills her. And it very well might. I wasn't sure, going into this one, if I was going to like it. 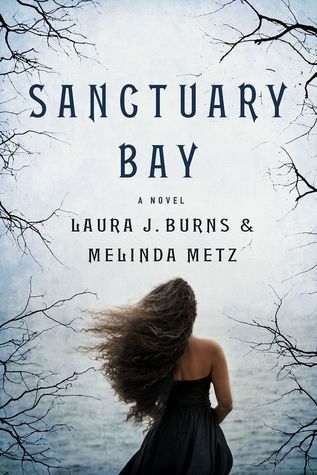 But it didn't take long for me to become completely immersed in the island of Sanctuary Bay. The mystery is a good one, and not an easy one to figure out. It leaves you constantly guessing, wondering who the good guys are, who the bad guys are, and who is getting played. The authors don't hesitate to write about the bad, and the dirty of what is happening at the school. There is murder and death, suicides. The story delves into a little bit of the science fictiony realm, which is what worried me. But I shouldn't have worried. It was well done, and interesting. The characters are all really well written, with even the major and minor secondary characters having their own roles in the story, Sarah and her friends, as well as Ethan and Nate are all good, solid characters. The romance between Sarah and one of the boys was definitely on that I rooted for. Her relationship with the other boy was just... disturbing. Sarah wasn't a person that I really liked, not at the beginning. I just didn't like her all that much. When she finally realized what was happening, and got together with her unlikely ally, she changed for the better, and I started liking her a lot better. The only issue that I really have with Sanctuary Bay was the length of the story, and the occasionally dragging pace. I think the book could have benefited from a little editing, but it wasn't ever enough to make me want to stop reading. Just a little lag here and there. But all in all, Sanctuary Bay was a great effort on the authors parts, and I am glad that I took a chance on them! Ooooooo.....this looks intriguing. I definitely want to pick this one up!